What Crop has the monthly contribution to forecasting accuracy in the accompanying chart? The primary crop growing season in the United States starts in late Spring and ends in the early Fall. While each days weather is different, each day also helps the crop grow. Some months of the growing season might be more important than others in determining the end of season final yield and/or production. Below is a different type of quantification. Earlier posts on June rain in Iowa and measuring NDVI provide examples of weather impact quantification on corn or soybean yields. Many people now know that the goal of CropProphet is to objectively quantify the impact of weather on crop yield and production. In the chart below we are using quantification is a slightly different manner. CropProphet shows that crop yields can be forecast with remarkable accuracy. Measuring the accuracy of the forecast at different times during the growing season allows us understand what time of the season is most important to determining yield. 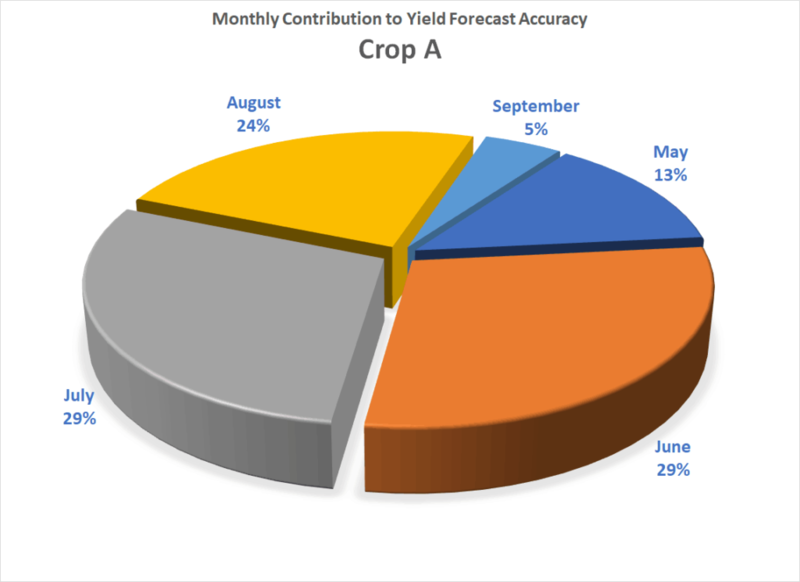 For this crop, June, July, and August have approximately the same importance to yield forecasting and therefore crop growth. The chart below shows the contribution to yield forecasting accuracy for a mystery summer crop. In the Twitter poll, please provide your answer to what crop you think it is. This entry was posted in Corn, Soybeans, Winter Wheat. Bookmark the permalink.